It has become something of a photojournalistic convention to go for the shocking image. Everyone knows that if it bleeds it leads. Photo editors bypass wire photos from the subcommittee hearing for the gruesome picture of a wounded child being whisked away from military violence. In a news cycle dominated by images, scenes of dazed family members wandering amidst the disarray of the latest bombing or tornado confront us with remarkable consistency. Disaster photojournalism thus offers a weekly, even daily reminder that we live in a world marred by (not so) random chaos and perpetual threat of displacement. And even though we know how daily, repetitive exposure to the threat of events beyond our control imposes something of a numbing effect on our collective conscience, we still are more likely to talk publicly about stories from which it is difficult—or perhaps morally obligatory—to look away. Either way, chatter often follows the image. Or not. Sometimes the image follows the chatter. Take this AP photograph of Richard Burton’s second-grade classroom in Indianapolis, for example. Altogether unremarkable when compared with the spectacular and widely circulated imagery of #ISIS and #Ferguson, this photograph feels like proof positive that some news images just go through the motions: 1) Common Core–a set of national curriculum standards for competency in English and math endorsed by governors in forty-five states–is a fall campaign issue, 2) we need a news wire image that signifies “education,” 3) go to the nearest school, 4) just shoot the damn picture. Unless Burton is reading My Pet Goat, there is nothing to see here, folks. Save historical exceptions on the scale of Little Rock, Arkansas in 1957, it is difficult to imagine developments in education policy as visually spectacular events. 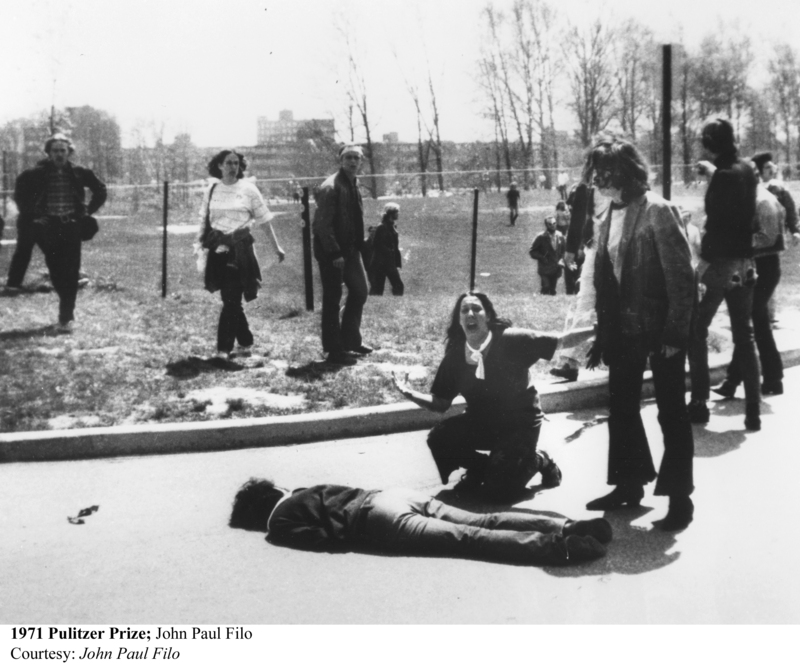 Memorable images from student protests in the 1960s, and even iconic images of police aggression at Kent State University in Ohio, have less to do with education per se than they do with domestic response to US foreign policy. In the main, education is a bottom-tier visual story. Rather than asking how photojournalistic depictions of education-related issues might garner a spot on the visual screamer headlines, this photograph invites reconsideration of the supposed flatness of more stock news imagery. So of course, there is something to see here, folks. Like any other image that gets taken up in public discourse, this one, too, is telling a story. If the story-telling feels uninspired, we can at least forgive the story-teller for feeling a bit boxed in. The singular, dramatic event that signifies “education” too often involves mundane transactions between teacher and student in the classroom, so in an obvious way this AP photograph relies exclusively upon the available visual means for illustrating schooling-related news stories. Teacher remains up, front, and center, reinforcing the association between whiteness and access to higher education. Pupils sit down below at their teacher’s knee, and non/authoritative roles are preserved. Individualized bookbag compartments shore up each student’s identity as an autonomous, liberal citizen. Primary colors mark a primary education. Richard Burton works with his second-grade class on telling the difference between imagined and real stories at George Buck Elementary School in Indianapolis. Indiana was one of the first states to adopt the Common Core education standards and also the first to abandon the benchmarks.